This Texas Peach Cobbler is one of our most popular recipes. Maybe’s its because we had so much fun making it or it’s everyone’s dream campfire recipe? Or it’s all Texan? Either way, it’s is amazing and we know you will love it. 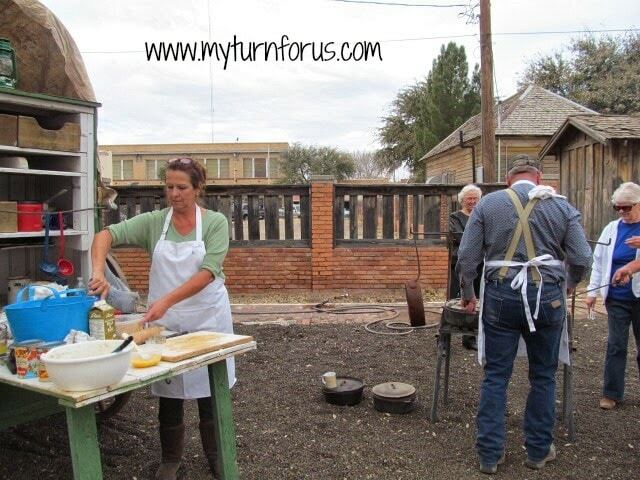 A couple weeks ago, my hubby and I had the opportunity to celebrate the birthday of Texas with an old-time celebration on Windmill Square in our hometown of Pecos, Texas. 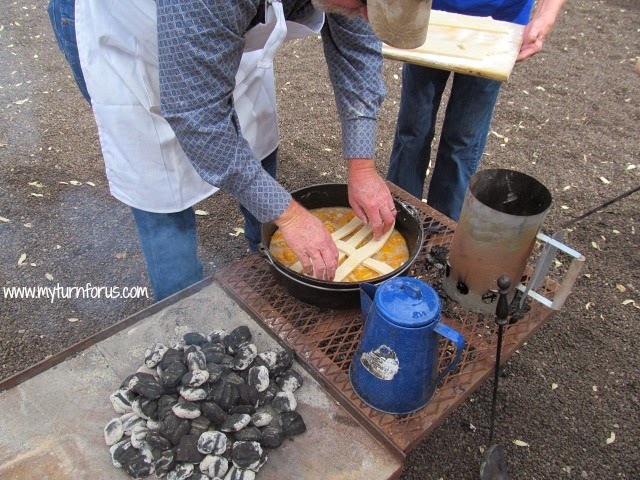 We were invited to demonstrate some old cowboy style Dutch Oven Cooking by making enough Peach Cobblers to serve about 100 people. 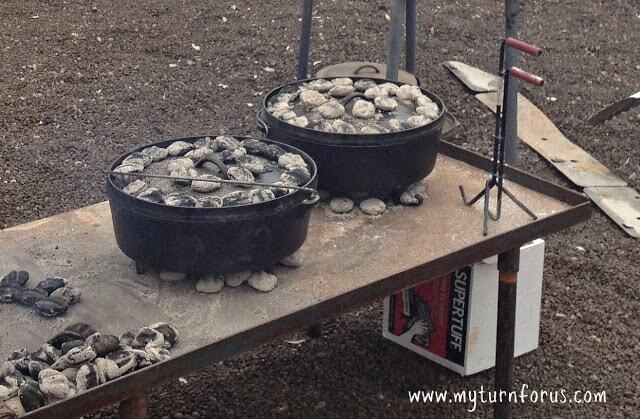 If you have never seen or done any cowboy style Dutch Oven cooking, it is amazing. My hubby can throw a batch of biscuits in the dutch oven, add coals top and bottom and come out with the best ever, perfectly browned biscuits right there by the campfire. They taste out of this world! I don’t have the room here to talk in depth about the old Cowboy Style Chuck Wagon cooks of yesteryear but I will soon, I promise. And we will be sharing more Dutch Oven Camping Recipes. 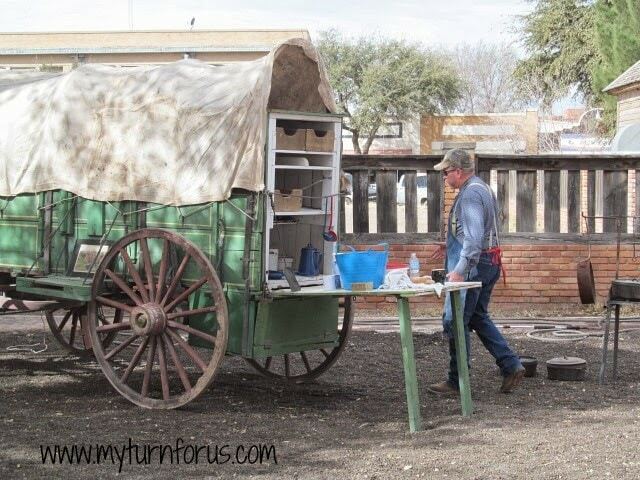 My momma-in-law owns an original Texas Chuck Wagon and the family parked it on Windmill Square, and we turned it into our kitchen for the day. Hubby tended the fire and I mixed up the peach filling and rolled out the dough. My momma-in-law helping the hubby with the latticework for the top of the Texas Peach Cobbler. The Hubby has a metal table so it gets the dutch ovens up off the dirt and it’s easier for these ol’ backs to bend over to tend to the cobblers. And it would work great for any of your Dutch Oven Camping Recipes. There are also several kinds of lid lifters, a simple lid lifter and the deluxe one shown to the right of the dutch ovens. This Texas Peach Cobbler is perfectly browned and ready to serve with the state of Texas on top. Many thanks and congratulations to my sweet hubby for helping with this post. He is amazing with Dutch Oven Cooking and Dutch Oven Camping Recipes. Cover with the dutch oven lid. Continue rotating the lid/oven in opposite directions every 10 minutes for forty minutes then carefully lift the lid and check to see if the crust is beginning to brown. Re-check every 5 minutes until the crust is golden brown. Everyone did a wonderful job! 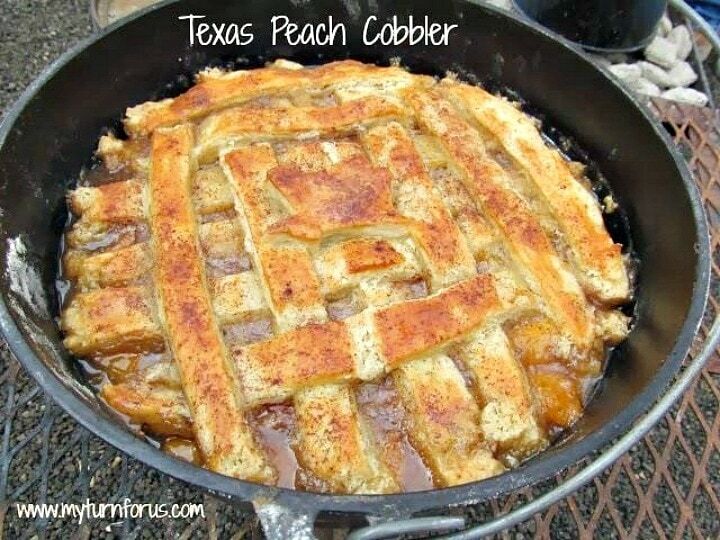 The Texas Peach Cobbler looks amazing! OMGosh this looks fabulous! Pinning for this summer's camping trip to the East Coast of Canada. Thanks for sharing at Simple Supper Tuesday. This looks so awesome. I love the covered wagon. Gorgeous to look at and craving a taste ! Looks absolutely amazing. I don't have the place or wherewithal for cooking with coals, but I reckon I could try this in my dutch oven on the barbecue. It is so cool that y'all were invited to give a demo. What an honor! The pie looks perfect…especially with Texas on top. (I hold a special place for TX–my son was born there.) Thank you for sharing this beautiful, perfectly golden pie, Evelyn. Sounds like fun! 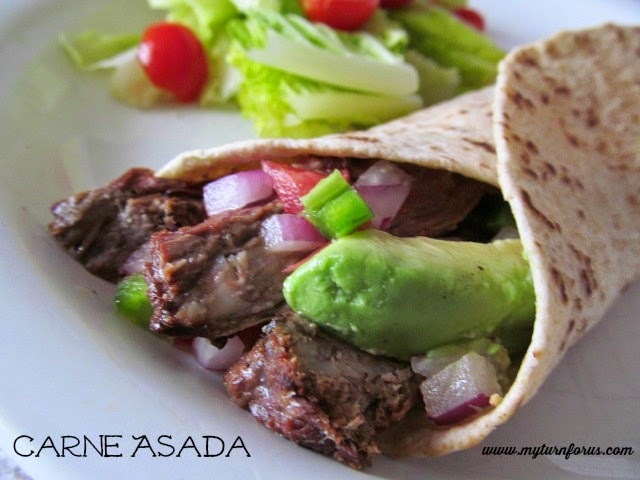 I would love it if you linked up to my Tasty Tuesday party! 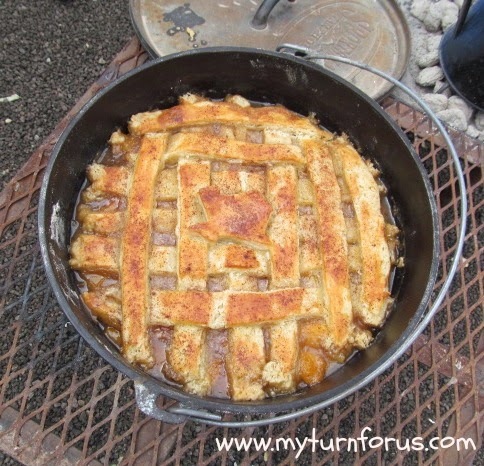 Your Dutch Oven Texas Peach Cobbler is just fabulous and what a fun challenge. We would have loved every second of the fun and food. We are proud of you and your Hubby, looks like you did an outstanding job!! 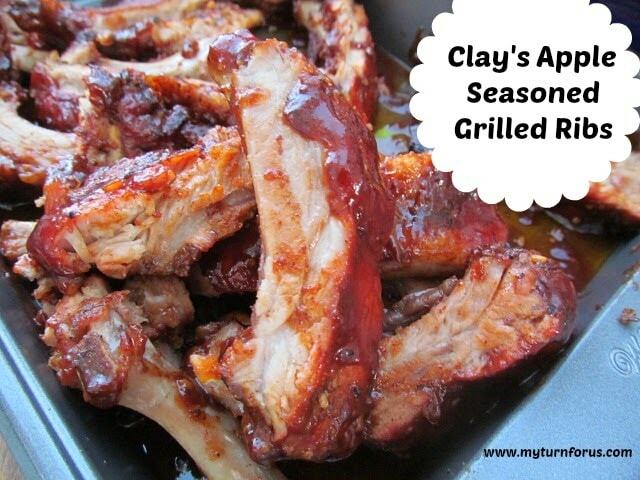 Hope you are having a great day and thanks so much for sharing your awesome recipe with Full Plate Thursday. OMG, I can't believe it – that is my very favorite pie – peach cobbler. WOW to bake a cobbler like that is amazing. Thank you so much for sharing this post. It looks like you all had a wonderful FUN time. I am your newest follower – so glad to meet you. This looks amazing. I love peach cobbler! Looks wonderful. I have a large dutch oven and our family is going camping this summer this will be a great time to use it. Thanks and by the way love your wagon. Those are so cool!! This looks like it was so much fun. I've been to similar celebrations a few times, and really enjoyed it. 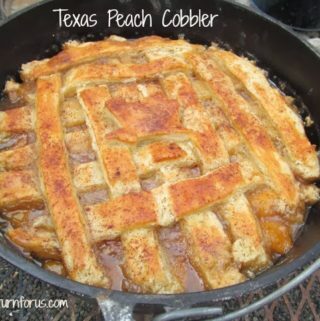 I'm intrigued with your peach cobbler cooked in a dutch oven, I have GOT to try making this in a cast iron skillet now. THANK YOU for sharing with us on the Friday Frenzy link up, and we hope you'll join us again this week! How lovely, it looks like so much fun! Your pie looks delicious too. Thanks for linking up to Sweet and Savoury Sunday, stop by and link up again. Have a great weekend!! My mom and I would devour that. I did a dutch oven with my girl scouts years ago. I think the experiences you have are so amazing. I think I was meant to be a cowgirl and live on a farm! Looks like a 14" DO If the cookie cutter is 4 inches? I have never tried it but I bet you could, maybe this would make two and the other could be frozen after you bake it? Could you substitute anything for the half & half? I don't typically keep it on-hand and this looks delicious. Are you using a 12" or 14" Dutch Oven? I am planning on making this Sunday and I'm super excited!!! We used both 12 and 14 inch Dutch ovens, we didn't have enough of either to feed the crowd and both worked great with this recipe! Enjoy! I tried to upload a picture but I couldn't figure it out. It turned out amazing! Thank you very much for the recipe! Karen, thank you for your interest. Since this was a one day event, we prepared our all our crusts ahead of time and placed them in the freezer until the day of the event. We removed them from the freezer that morning and rolled them out at the chuck wagon and cooked the peach cobblers on the fire. We prepared about 7-8 of these peach cobblers and this was just a tasting even so full helpings were not offered. We prob served a little over 100 people. I made this in the oven for Thanksgiving and was a little nervous having never made a cobbler, not to mention crust. I used lard instead of shorting and it looked gorgeous when finished. I took it over to our friends at the dinner and was hoping it tasted as good as it looked. Though there was many sweets to choose from the cobbler was devoured in moments. I did warn everyone that it was not diet friendly and they loved it. Unfortunately I have to take everyone's word that it was delicious because I am diabetic but it is my new go to desert that everyone ask for. I'm cooking one in the dutch oven outside in the new year so wish me luck. Thank you for the recipe! My husband and I loved it! Thanks so much for letting us know you enjoyed our cobbler. I noticed you’re from Ft Stockton so I’m sure you are familiar with Pecos. Glad to meet someone in that part of the country. Hugs my Friend!